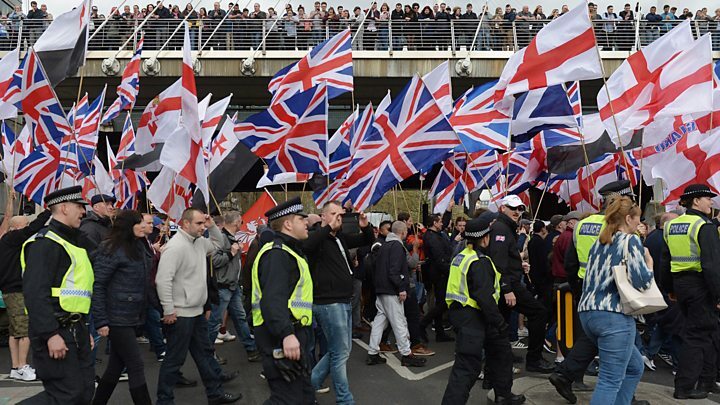 The number of people referred to the UK's terrorism-prevention programme over concerns related to extreme right-wing activity jumped by 36% in 2017/18. Prevent, which aims to stop people being radicalised, received 7,318 last year, of which 1,312 were for far-right extremism, up from 968 the year before. Referrals for concerns related to radical Islamism decreased by 14%. Security minister Ben Wallace said the programme tackled radicalisation "wherever it is found". BBC home affairs correspondent Dominic Casciani said a "rise in extreme right-wing activity, particularly online", was behind the increase in referrals. Shadow home secretary Diane Abbott, meanwhile, said the "overwhelming majority" of people referred to Prevent "do not require any anti-terrorism procedures at all". Of the cases examined by Channel, 394 subsequently received support through the scheme, including 114 aged under 15. Engagement in the scheme is voluntary and it is not a criminal sanction. The controversial Prevent scheme is essentially a system which aims to identify vulnerable people and intervene in their lives before something bad happens. The local panels - which include police, social workers and other experts - look at reports coming in from teachers, the public, the NHS and others. A huge proportion of these referrals are false alarms - in fact the number of cases which experts immediately dismissed rose 16% in the year to March 2018. The proportion of individuals who cause such concern that they need concerted help to de-radicalise, through the "Channel" mentoring programme, remains consistently low at about 5%. That's not to say that mistakes aren't made. This latest data covers the summer of 2017 when Surrey County Council's botched attempt to help turn around the life of Ahmed Hassan, the young man who later tried to bomb a London Underground train. The latest figures also showed thousands of children and teenagers have been flagged up over terror concerns. In the year to March, 2,009 under-15s were referred, including 297 girls. The number in the youngest age group increased by a fifth on the previous year, while more than half of those reported for possible de-radicalisation interventions in 2017/18 were 20 or under. Referrals over Islamist extremism concerns fell from 3,704 to 3,197. The Home Office said that, of those who have left the Channel process, more than four in five did so with "no further terrorism-related concerns". While police and ministers say Prevent forms a crucial plank of anti-terror efforts, the scheme has repeatedly come under fire, with critics labelling it heavy-handed and "toxic".